All images courtesy of the artist & VNH Gallery. In "Interpreter's Booth," Martin Lukáč and Anu Vahtra activate pictorial and gallery space to create an exhibition that positions the viewer as a self-aware actor in a site-specific position. Vahtra's large, drywall and metal structure bisects the space, creating an obstacle for the viewer. This form is akin to an interpreter's booth in which translators at events perform their often-rushed duties in real time. In the same way, the hasty art spectator finds limited dexterity in this abstracted gallery space. Vahtra develops an abstract spatial construction that questions the nature of the white walled gallery space and its impact on the viewer's interpretations. Simultaneously, Lukáč's paintings obstruct the painterly, pictorial space and historical objectness. His colorful works are riddles of form and substance, sometimes representing literal objects. Lukáč's paintings here include jagged lines and occasionally geometric forms that allude to the spacial presence of the gallery. These works are windows into a painterly space, a give and take between the viewer, space, and painting itself. That is, the work is aware of its surroundings. 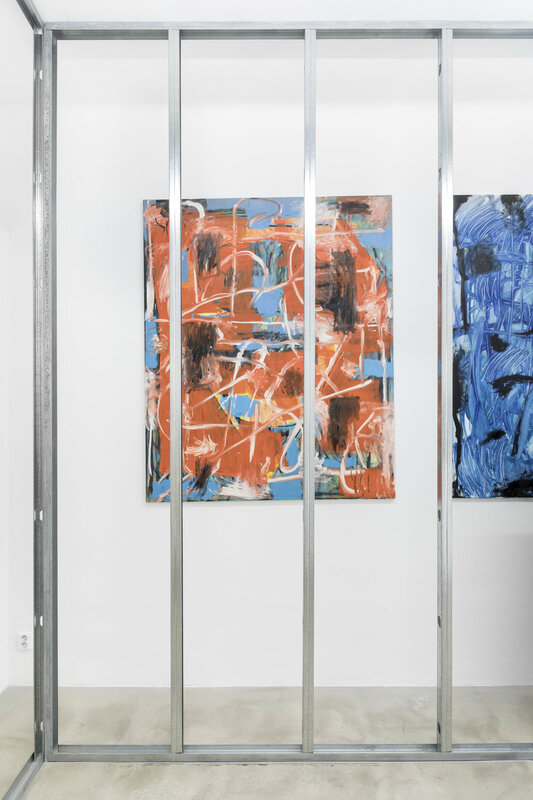 Together, Lukáč and Vahtra create a puzzling exhibition that reinforces the abstract nature of the artist-viewer-gallery relationship, one which is constantly evolving and often lost in translation. In Paulo Arraiano's powerhouse exhibition at Hawaii - Lisbon gallery, he takes on digital life's vast modes of escapism and channels them to depict a synthetic resurgence of natural phenomena, often translated through satellite signals. This repositioning of the environment as forms determined by data and coding illuminates the contemporary sensory experience, one of a digitally mediated existence. Nevertheless, Arraiano is effective in positioning the viewer to instinctively yearn for human interaction with our physical domain. A flag-like object juts off the wall with a landscape scrolling to the floor in a display of technological devotion. A small cactus perches well above Arraiano's technological representations as a looming reminder of unmediated reality removed from its natural habitat. In tandem, these signifiers suggest a hierarchy of existence that engenders feelings of artificiality in digital sensory experiences. Simultaneously, though, Arraiano presents the breadth of the human will to understand the literal world as it exists around us with the most advanced tools available, particularly GPS imaging. 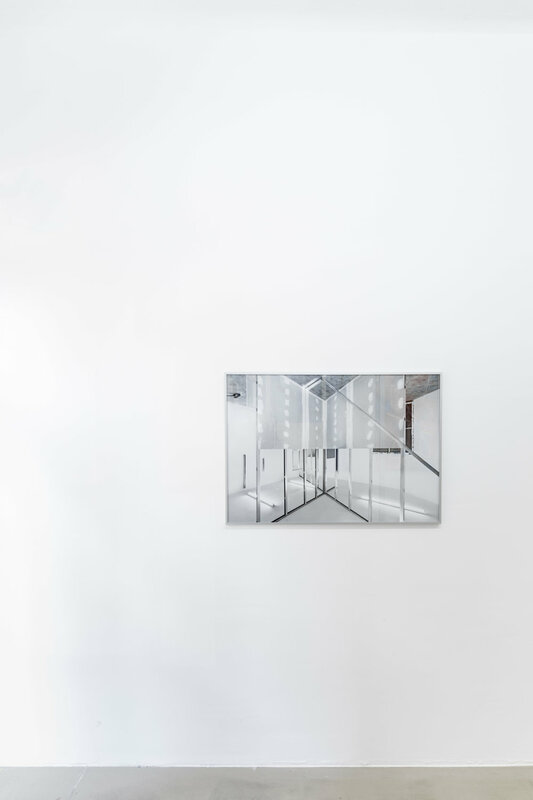 Equally distinctive is the formally minimal dialect Arraiano develops by thinly dispersing objects throughout the exhibition as a presentation of dematerialization in our daily happenings. The exhibition is efficient in creating signifiers that can be read quickly and are perceivable through the internet, providing recognition to the ever-increasing speed of human information consumption. Here, the functional object is primarily a means for presenting the artist's collections of information depicted behind a screen or controlled by satellites and then regurgitated to online viewers. The result is an intellectually thrilling exposé on the landscape and its interaction with contemporary filters that limit our access to its physical presence while oversaturating us with artificial and mediated imagery of nature. Arraiano's exhibition runs from October 21 through December 22, 2017 and is open Thursday through Saturday from 12-6pm at Hawaii - Lisbon. "NOIR," Joshua Evan's solo exhibition at ASHES/ASHES, brings the digital realm to physical space as angular forms meet EMF shielding paint. Evan's all black exhibition is formally minimal, the aesthetic of which he shrewdly controls as a carrier for meaning through his subtle yet hard hitting choices that comment on the ever increasing scope of digital life. Formal qualities of Evan's paintings introduce a complex conversation about the impact of internet culture on historical notions of the painterly image. 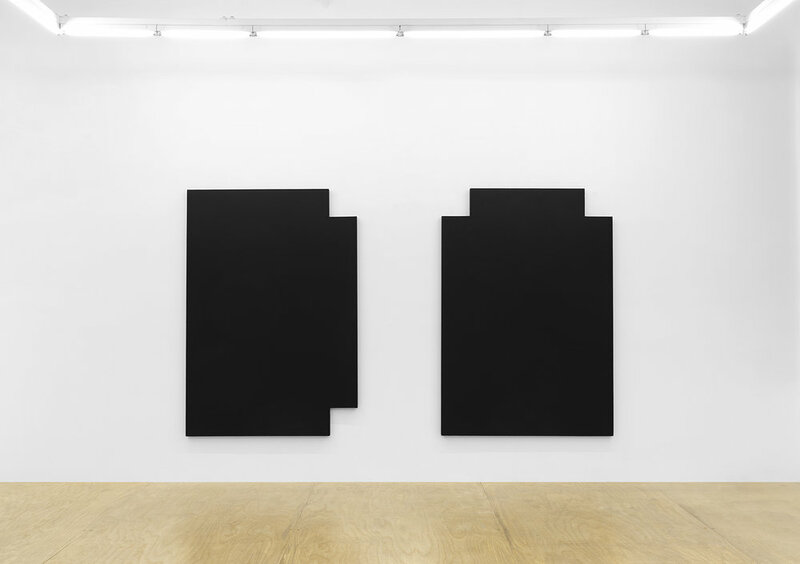 His completely flat, black forms tow the line between JPEG and painting. 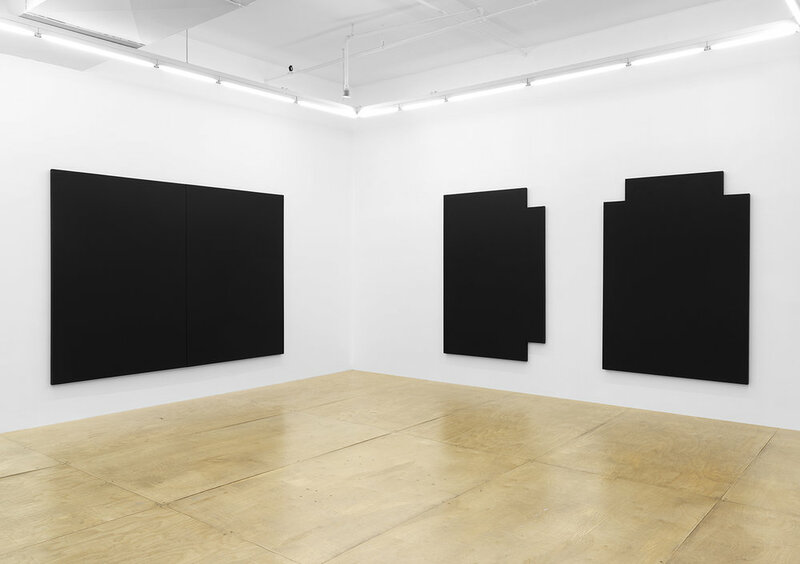 The space of the white cube is censored by the black paintings that sit on top of them, as Evan's shaped canvases create a void that obscures the space rather than adding representation. For instance, in the case of Shielding Monochrome #4 and Shielding Monochrome #5, the squares missing to one side of either painting feel like dead pixels in this space. The young artist, born in 1991, shrewdly employs his materials as a primary form of iconography to create underlying storylines relating to contemporary media and our bustling, digital footprints. Evan's EMF shielding paint is most commonly used to block cell phone, radio, and TV signals, but here it is a physical reminder of our contemporary reliance on a digital existence. Evan, who often brings attention to our electronics, creates wry humor by cruelly jamming them or, in the case of a recent sculptural work made of iPhones, chopping them in half and stacking them. The artist's focus on jamming takes a futile turn for many of Evan's viewers who will view the exhibition exclusively through the internet. Evan is tied to an online art scene particularly prevalent on Instagram and consisting primarily of young artists and curators who engage directly with their audiences via social media. Evan has been included in many recent projects of this ilk, from Scandale Project's ART IS volume published this past March to an exhibition of the Bech Risvig collection at Huset for Kunst og Design, which contains many artists involved in the online scene. Evan's exhibition is yet another sign of a diverse generation of artists and curators who made their names online increasingly making the jump to real exhibition spaces. Here are a few names to look out for: Asger Dybvad Larsen, Chris Trueman, Francesca Longhini, Gijs van Lith, Grant Wells, Jason Gringler, Jenny Brosinski, Jonni Cheatwood, Marco Pariani, Paul Weiner, Pedro Matos, Ricardo Passaporte, Taylor A. White and any number of artists who have been featured on the Young Space blog. "The Pendulum Movement (The L.A. Paintings)," installation view. Image courtesy Baert Gallery. Trembling, José Manuel Ciria, 2016-2017. Image courtesy Baert Gallery. Crows and Flamingos, José Manuel Ciria, 2016-2017. Image courtesy Baert Gallery. Chicken Footprints, José Manuel Ciria, 2016-2017. Image courtesy Baert Gallery. Deassembled Composition, José Manuel Ciria, 2016-2017. Image courtesy Baert Gallery. Blessed Onion, José Manuel Ciria, 2016-2017. Image courtesy Baert Gallery. Crazy Unicorns, José Manuel Ciria, 2016-2017. Image courtesy Baert Gallery. Clockwork Cerulean, José Manuel Ciria, 2016-2017. Image courtesy Baert Gallery. Dark White, José Manuel Ciria, 2016-2017. Image courtesy Baert Gallery. "The Pendulum Movement (The L.A. 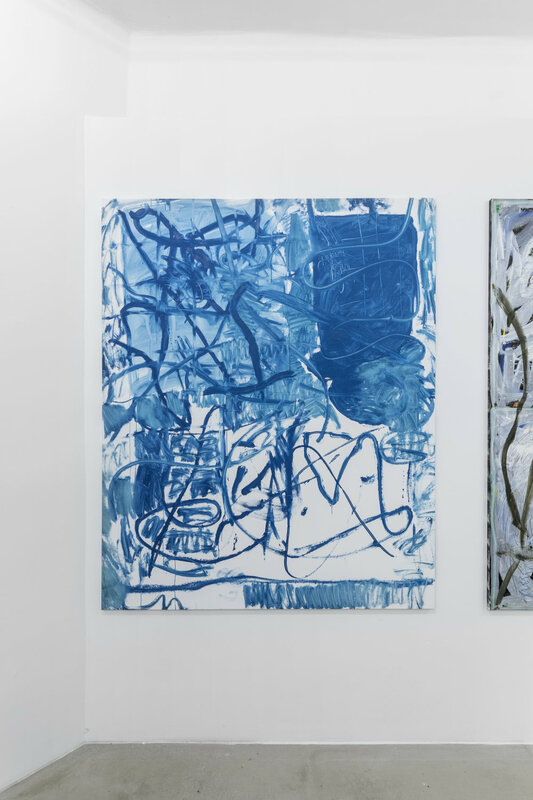 Paintings)," José Manuel Ciria's current exhibition at Baert Gallery in Los Angeles makes a statement of the virtuoso Spanish artist's most recent works that are derived from the artist's newfound mingling of aesthetics. Ciria's conflux of bravura develops out of various modes and rules of painting that he has developed and written about over the past three decades, but the works that he includes in his "Procedures Series" feel fresh. Ciria's new paintings break from his historically tactical theoretical concerns and accompanying texts to illicit a radical sense of freedom. Ciria's instinctual sense of painting seems to have brewed for decades, finally letting loose in a dynamic and free exhibition that highlights his formal brilliance. Aesthetically, these works are high powered with rich chromatic strokes of orange juxtaposed against dirty and muted backdrops. Moments of intense, impasto paint are blazoned across the surface, enveloping the viewer in a fiery tornado of motion and refined gesture. Geometric abstraction makes an appearance in a hard edged way in Crazy Unicorns while messy forms in Blessed Onion mark a shift from Ciria's recent series of box paintings, which relied on a heavily governed and strategical process. However, Ciria manages to create intense variation from canvas to canvas with some works tight and dense even as others are splattering balls of action painting. In pieces like Clockwork Cerulean, gestural drawing commands the space while others such as Trembling are nearly solid blocks of paint. Referential influences vary broadly from piece to piece, making parallels to Julian Schnabel's "Dedications" paintings of the early nineties, Joe Bradley's recent works, Gerhard Richter, and even some abstract expressionists. The result of Ciria's hodgepodge of styles and rejection of his previously systematic way of working is a set of paintings that seem intertwined with postmodernism in their decentralization. The works are romantic and democratic, open to interpretation. Even three decades in, it seems that Ciria has opened a new and expansive dialogue worthy of many more years of exploration. "The Pendulum Movement (The L.A. Paintings)" by José Manuel Ciria runs from May 27th - July 8th, 2017 at Baert Gallery in Los Angeles. The paintings in Tom Savage's Love Notes from the West at TW Fine Art bring widespread calamity to works that have traveled from California to Brisbane, Australia. Savage's works serve up iconography that recalls abstract expressionism while allowing for choreographed disruptions of representational and symbolic forms.